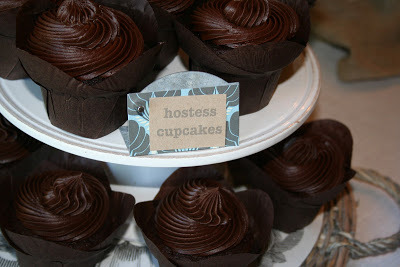 I had a few people over for lunch today after church and had a request for the recipe for these cupcakes. The frosting is the best I have ever had. It takes a little extra time to chill before you beat it on the last step, so plan ahead. It is also a little expensive, but you can use a couple of substitutions to reduce the cost. It is worth it. The cake part of the cupcakes is from a box. Duncan Hines Devil’s Food. Prepare according to package directions and beat a FULL 2 minutes. Use cupcake papers and fill them almost full. Should make 16. The box says 24. Those are some pretty sad looking cupcakes if you get 24 out of it. Bake at 350 for 15 to 19 minutes. Set your timer for 15 minutes. Remove from oven when the top springs back when touched or when you put your ear down by them and you cannot hear them crackle. Note* The chocolate cake we had today was a Duncan Hines Milk Chocolate cake made according to package directions with the same icing as the cupcakes. Cool cupcakes completely before filling. Put Cream filling in a pastry bag with a decorative tip. Push the tip into the top of each cupcake and squeeze the bag. You just have to guess how much is going in. Fill all 16, then go back and add some if you have any left. In a 4 quart saucepan over low heat, combine the cream and butter. Stir until butter is melted. Whisk in the chocolate until melted, stir in the vanilla. Add sugar, cocoa and salt. Whisk until smooth. Be sure the cocoa powder is dissolved completely. Pour into a 9X13 pan and freeze until firm, about 2 hours, or pour into a mixing bowl and refrigerate overnight. Remove icing from refrigerator and let stand at room temperature for an hour. With a stand mixer fitted with a whisk, beat icing on high until fluffy about 2 minutes. If it is too thick, start out with a paddle and beat a couple of minutes then switch to the whisk. I froze the cake and then spread the icing over it. You could frost it and freeze it also. It will thaw in a couple of hours and will keep the icing chilled. Cupcakes can also be frozen either with or without the frosting.